Sometime s the "blues" are not a bad thing! 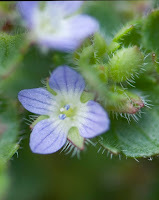 Today I had a good case of the blues --- a blue sky was seen for the first time in days and lots of blue wildflowers were blooming in the yard! 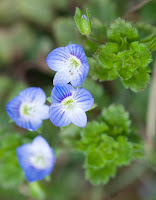 :) The Birdseye Speedwell (Veronica persica) is blooming so profusely in some areas, it looks like puddles of water reflecting the sky! I found this plant blooming in the soccer field near my house (right). Not far off was another kind of speedwell, Ivy-leaf Speedwell (Veronica hederaefolia), it has more lavender-hued flowers (left). When I was a child, I was fascinated by the pretty flowers of Vinca (Vinca minor) that grew in the woods near my house (right). So, w hen I moved into this house, I transplanted some from my old neighborhood in Nashville. Big mistake!!! It is an evergreen ground cover that can take over very quickly. I have to pull a lot of it up every year to keep it under control. It does have interesting flowers if you look at the center very closely. 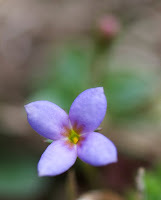 The 1-1/2" tall Small Bluets (Hedyotis crassifolia) are very easy to overlook (below). They bloom much earlier than the taller and more blue Quaker Ladies Bluets. There is an old cemetery down the street. It is a fascinating place to do photography. 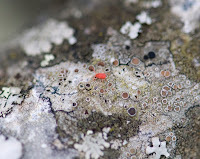 I enjoy seeing the various lichens on the headstones. 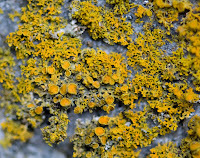 This yellow one, called Lemon Lichen (Candelaria concolor) is interesting to look at through my macro lens. I love doing macro photography, it really makes me pay much closer attention to tiny details. 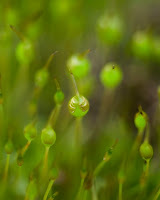 The moss spore caps are a good example (right). As I was walking back to the house some other tiny white flowers caught my eye. These plants were only about 2" tall, I'm sure they are often stepped on and never even noticed! 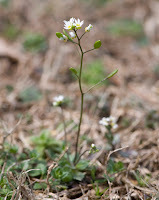 In warmer years, Whitlow Grass (Draba verna) often blooms in late February (left). Like many other plants in the Mustard Family, the flowers start making fruits even before the petals have fallen off the flowers. 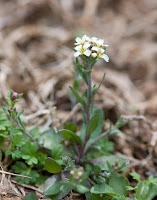 I was surprised to see another species, Shortpod Whitlow Grass (Draba brachycarpa) blooming nearby (right). Like its "cousin," it too was only a couple of inches tall. 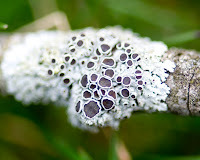 It had clusters of much smaller flowers. 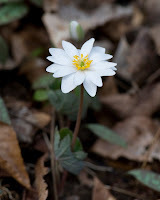 I was excited to learn this was a new flower for my life-list! 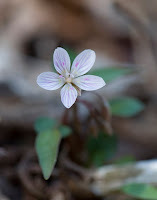 :) It is #2427 and my first new wildflower for 2010! I've lived in this neighborhood 29 years so I'm amazed I have never seen it before. That is what I love about exploring nature! When I went out to put the recycle bin on the curb I noticed a lot of limbs that had fallen in the yard during the recent strong winds. 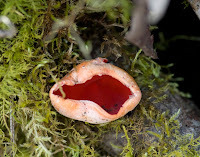 As I was putting the limbs into the bucket to throw them out I noticed they had some interesting fungi and lichens on them, so I went inside and got my camera. It doesn't take much to mak e my "ADD" kick in and get me off track! 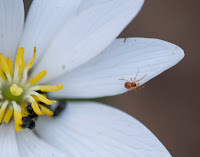 :) As I was picking up one limb, I noticed a tiny orange mite crawling across the surface. It is VERY difficult to get a decent photo of a 1mm critter that is in constant movement with a macro lens and no tripod! I like to challenge myself! The maple trees are blooming, giving them a red hue. Thanks to the squirrels that like to bite the blooming twigs off, there were several of them on the ground. 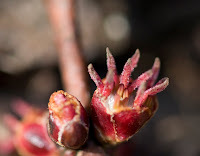 It is hard to believe that in about another month or so these tiny red flowers will become the large green "helicopters" that twirl down from the trees in a strong breeze. These are the female parts of the flowers, the pistils. The male parts, the stamens, are just barely visible because they have not yet emerged. The two genders don't emerge on the same tree at the same time in order to prevent self-pollination. Last week I pulled up many Bitter Cress weeds and just tossed them in the yard . Today I noticed one that had become a "zombie", it had been torn from its roots, was upside down and the leaves were wilted, BUT the flower stems had turned upward and they were still blooming!!! A floral Twilight Zone! :-0 These little non-native weeds are awful, they have pods that pop and throw their seeds. They are on e of the first plants to bloom in the spring. 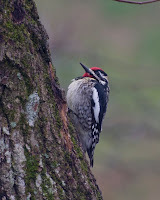 I was happy to see my bird buddy, the Yellow-bellied Sapsucker back at the suet feeder today! He is such a handsome guy. I hope he will find a "girlfriend" soon and establish a territory in the neighborhood. Just as I was getting ready to go back in the house, I noticed at lethargic honeybee o n one of my patio planters. I guess it was still a little cold for her. It gave me a chance to get some shots of her before she took off. It was interesting to see how hairy she is. It is easy to see how honeybees can be so efficient in spreading pollen. Note the little ovals on her abdomen, those are her spiracles, the breathing holes.